This blog post is a product review. I’m trying out the Data Viewer Web Part by a company called Lightning Tools. 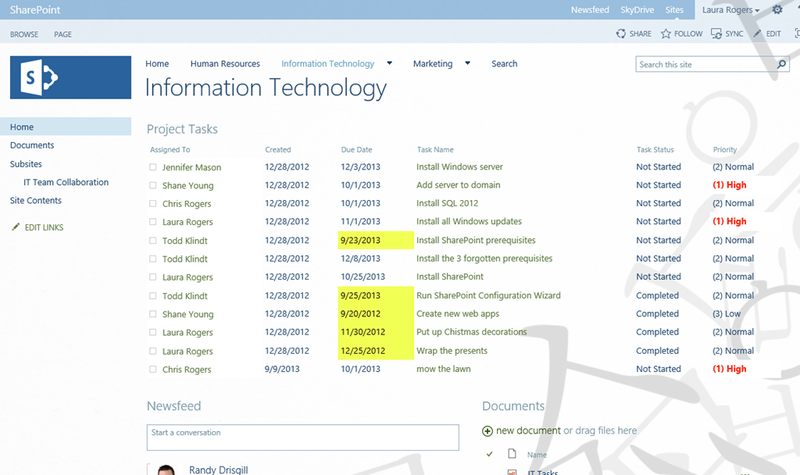 When I came to the realization that the design view is no longer in SharePoint Designer (in 2013), and it isn’t coming back, like many of you I was upset and frustrated. Fortunately, the great developers at Lightning Tools have solved this issue! They have created a product called the Data Viewer Web Part that lets you accomplish the same things we used to need SharePoint designer’s design view to accomplish. This post is a demo… just me trying out this product. Here is a screenshot of my page, with the end result! This is a task list with due and overdue task dates highlighted in yellow, and high priority text in red. How did I do it? The first thing to decide is where does your data live? You have many different choices here, you’re not just limited to SharePoint data. This is the Web Part tab, showing the drop-down of data sources you can pick from. I’m picking a SharePoint list. On the next tab, Data Source, I get to pick which specific list or library I want to display. I can pick from any site collection, and drill down to the site and the list I want. What’s audience targeting? Every list and library has a setting that lets you turn on audience targeting. When you do this, each individual item with have a new field called audience, which lets you select a SharePoint group or defined audience of people, to target that specific item to. IF you have that setting turned on in your list or library, then you can use that checkbox here in the web part and each item in the list will then only be seen by the audience that it is targeted to. The best description I found about audience targeting is here (still applicable). Okay, so now that I’ve picked my task list, what’s next? I head on over to the Columns tab. I just put check boxes next to the columns that I want displayed. How do you rearrange them? I can literally just drag them around! So I drag the Task Name up a bit so that it’s the first one displayed. If I want to add any filters, I click the little filter button next to that column. So, if I wanted to filter to only show things that are due today, I click the filter button next to the due date column, and check the box for Today. Then, I need to click the little green plus button on the right, and THEN click Save after I’ve added all the filters I need. See, the filter I added is shown under “Modify filter conditions” and if I want to add more, I use the “Add new filter conditions” section. I can even do complex filtering with AND and OR statements, using the advanced filtering button at the top of this columns screen. Next, onto the Display tab. This is where all the fun happens. You can do multiple things, like add conditional formatting, set the format for each different column, and even decide things like whether to show the header (column names) and what message you want displayed if no items are returned in your filtered list. You can change the name that is displayed for each column, so I want the Task Status to say just Status, so I type that in the Alias box. Most of this is really easy and self-explanatory. If you select things like bold and colors here in the columns, those will apply to everything in the column, but if you want to make it conditional, click on the little icon in the formatting column. For linking, that means you get to pick which field the users can click on to open that item. You don’t have to pick one, but I went ahead and picked the task name. That checkbox for “Link to item directly” applies to libraries, so that you are opening up the file instead of just the properties screen. What I love about this screen, is that you get even more info about each of your fields when you hover over it. For example, when I hover over Due Date, it tells me that the internal name is DueDate, and that it’s a data type of DateTime. So helpful! Also, do you want to provide users the ability to add/edit/delete the items from here in your web part? That’s what those bottom three checkboxes are for. A little more about the conditional formatting… When you click the little icon next to the column name that you want to format, you pick your formatting and then which condition you want it to be formatted under. Then you have to remember to click the little green plus button before clicking any other buttons. This screenshot is the formatting for my priority column. I want the text (fore color) to be displayed as red and bold only if the value of the priority field is (1) High. After I’ve added one or more conditions, they are shown under “Modify filter conditions” and then to add new ones, I use “Add new filter condition” and click the green plus each time. After I’ve added conditions and I see them listed under “modify filter conditions” then I click Save. Very cool! Save the whole thing and now I have a beautifully formatted web part. Love it! 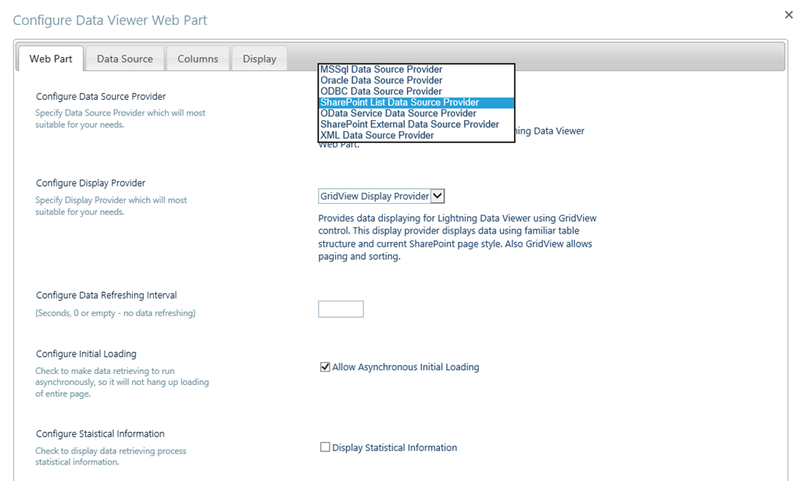 This is such a time saver compared to having to do all of this in a data view web part in SPD. This was really just a high level overview. There are so many neat little settings here and there. This product gets my two thumbs up! You can request a trial version here. Have you used this web part for any of your projects? I was looking to buy it for our company and would appreciate some feedback from you based on your experience. Yes, I’ve used it on a couple of projects and it went really well. Being a consultant, it depends on what money the customer is willing to pay for 3rd party apps, so most of them don’t buy them just in general.